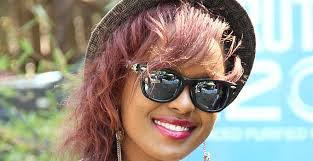 Judith Nyambura who performs under the mononym Avril is arguably the best female songster in our land of splendor. The stunning and breath taking beauty who doubles up as a sultry talented actress is known for having irresistible and tempting assets. She is always the dream chille for many men, even though she ‘disappointed’ Kenyan men when she got engaged to a South African millionaire. The classy and sassy music queen who is currently signed to Rabbit’s kaka Empire shared the below photo flaunting her flawless and lip-smacking thighs. Take a look at Avril’s thayology, what a brazen lass!